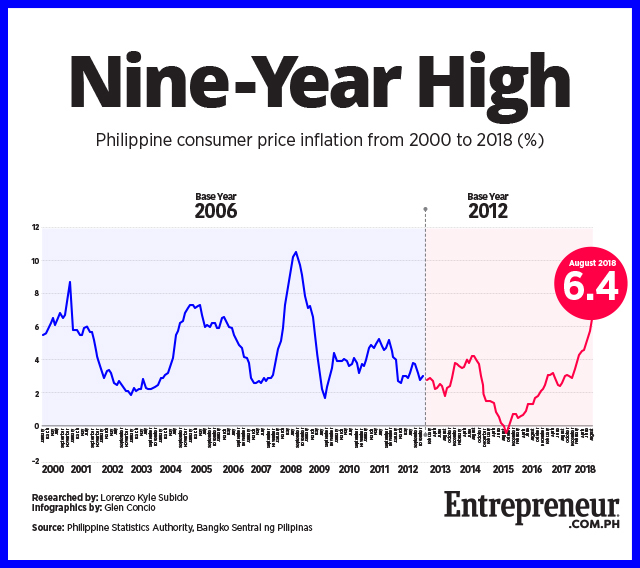 The annual inflation rate, a measure of how fast consumer prices have risen in the past year, surged to 6.4 percent in August, the Philippine Statistics Authority (PSA) announced on September 5. The PSA noted that the higher inflation rate is attributed to the faster price increases in food and non-alcoholic beverages, which experienced an 8.5-percent increase in consumer price index, as well as alcoholic beverages and tobacco, which saw prices rise by 21.6 percent year-on-year. “All the food groups registered higher annual increments in August 2018 compared with their previous month’s annual rates, except for the corn index," the PSA noted. Rising food costs are partly due to a surge in rice prices in recent months due to delays in the importation of the grains from other countries to augment local price production that isn’t enough to meet domestic requirements. Other types of commodities which saw prices increase year-on-year are furnishing, household equipment and routine maintenance of the house (3.5 percent); health and restaurant and miscellaneous goods and services (4.0 percent); and recreation and culture (2.4 percent). On a geographical level, the National Capital Region experienced a faster inflation rate than the rest of the country, reaching 7.0 percent in August 2018. That compares to the 6.2-percent inflation rate experienced by the other regions in the same period. However, the PSA noted that the highest inflation rate this August was seen in the Bicol Region, which stood at 9.0 percent. A tweet by GMA News quoted Budget Secretary Benjamin Diokno as saying that the Development Budget Coordination Committee (DBCC), whose members include the country’s economic managers, will meet to revise the 2018 inflation target. The current year-to-date average is at 4.8 percent, which exceeds the government’s target of two to four percent.